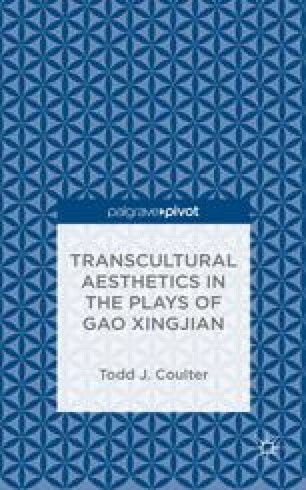 Following the chapters on jingju and absurdist aesthetics, this chapter takes up Gao’s sense of aesthetics, one that draws on both traditions and arguably goes beyond them. Gao has a concept of the tripartitioned self, or the actor in three parts. There is a neutral actor, the actor, performing-character, and the character. The chapter recognizes similarities to Brecht’s performance theories, but goes on to demonstrate how Gao’s dramaturgy activates his tripartitioned actor in different ways. The chapter introduces a semiotic lens to demonstrate this and takes up the importance of language in Gao’s work and how it disrupts identity.